Shirts With Random Triangles: Arkansas RB Jonathan Williams suffers foot injury, out for "extended period of time." 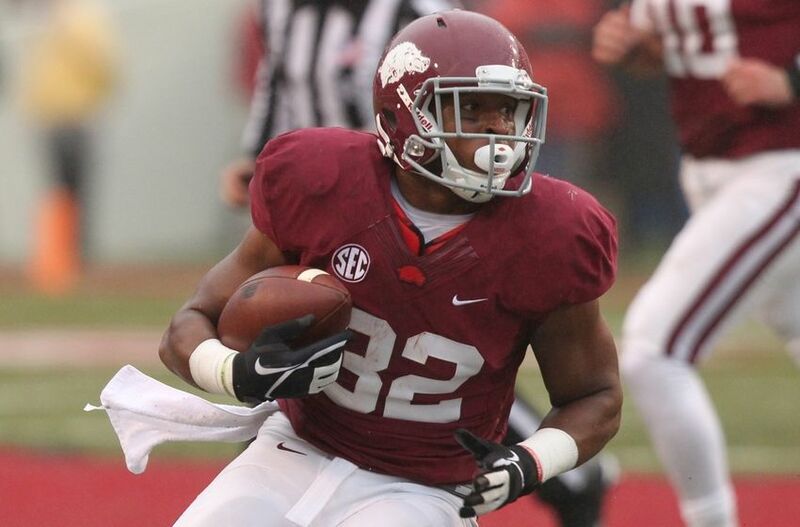 Arkansas RB Jonathan Williams suffers foot injury, out for "extended period of time." Jonathan Williams. Image via razorbackers.com. There's bad news coming out of Arkansas. Running back Jonathan Williams, the Razorbacks' leading rusher in 2014, injured his foot during practice on Saturday, and may be out for a while. Arkansas head coach Bret Bielema announced Williams will require surgery for the injury which was suffered in a scrimmage game on Saturday. Arkansas football's official website states that Williams "will miss an extended period of time during the 2015 season," but "is expected to make a full recovery." Arkansas head coach Bret Bielema expressed optimism in Williams making a complete recovery in a statement released by the school. Williams rushed for 1,190 yards in 2014, and was expected to be a key player for the Razorbacks this season.